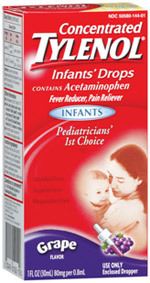 As of April 30, 2010, McNeil Consumer Healthcare (maker of children’s medications such as Tylenol, Motrin and Zyrtec) has issued a voluntary product recall of all lots that have not yet expired of over-the-counter children’s and infants’ liquid products manufactured in the United States and distributed in the US< Canada, Dominican Republic, Dubai, Fiji, Guam, Guatemala, Jamaica, Puerto Rico, Panama, Trinidad & Tobago, and Kuwait. The McNeil Consumer Healthcare, Division of McNeil-PPC, Inc. has also supplied a link through which you can request a refund or high value coupon as compensation for the discontinued products. Word to the wise, if you want a refund, DO NOT THROW THEM AWAY until you copy off the required information for the refund: Product Name, NDC#, LOT#, and Expiration Date. If you are a mother like me living in Arizona during the worst allergy season in history, this will definitely be a valuable link since I currently have a medicine cabinet full of these products that will shortly be visiting the trash can…but not before I request a sizable refund! For more information: Visit McNeil’s frequently asked questions page.